GOTTFRIED HELNWEIN: DER MALER UND SEIN HOLOCAUST-MAHNMAL FÜR L.A.
Ein Film von Claudia Teissig. 50 Jahre nach der Reichspogrom-Nacht - im November 1988 - liess Österreichs Schockmaler Gottfried Helnwein vor dem Kölner Dom auf eigene Kosten eine Galerie des Schreckens errichten. Hundert Meter lang, jedes der Bilder vier Meter hoch: Fotos von Vier- bis Achtjährigen - der Tod in ihre bleichen Gesichter geschrieben. Kaum war die Bilderstrasse errichtet, kam es zu den ersten Beschädigungen. Nun stellt Helnwein seine künstlerische Auseinandersetzung mit dem Holocaust in seiner Wahlheimat Los Angeles aus. Dort fühlt Helnwein sich am "Äussersten Punkt im Prozess des Untergangs des Abendlandes" angekommen - und sieht die Stadt als Herausforderung. Für 2004 bereitet er eine grosse Retrospektive in Pekings "verbotener Stadt" vor. TREFFPUNKT KULTUR hat den Maler in L.A. besucht. SURVIVORS, ACTIVISTS, DIPLOMATS AND CELEBRITIES JOIN AT MUSEUM OF TOLERANCE TO COMMEMORATE. On Sunday, November 9, at 7:00 p.m. the Museum of Tolerance commemorated the 65th anniversary of the infamous 1938 Nazi "Night of Broken Glass" (Kristallnacht) pogrom. The Wiesenthal Center's observance of the 65th anniversary of "Kristallnacht" was highlighted by the presentation of the work of Gottfried Helnwein and the screening of "Ninth November Night," a documentary about the artist's commitment to remind the world of the Holocaust. Austrian artist Gottfried Helnwein's work is collected by many of the world's leading museums, including the Los Angeles County Museum of Art. He has been presented in significant one-man exhibitions in such venues as the State Russian Museum in St. Petersburg, the Albertina Museum, Vienna, the Stadtmuseum Munich, the Fine Arts Museum in Otaru, Japan, the Musee' De L' Elysee, Lausanne in Switzeland and others. He is currently preparing exhibitions for 2004 at the Fine Arts Museum San Francisco and the Fine Arts Museum in Beijing, China. Mr. Helnwein, born after World War II and not a Jew, became aware during childhood of Austria's and Germany's active involvement in the hatred and atrocities of Nazism, and chose to speak out publicly and through his art, lest a country forget the past, forgive itself and repeat its errors. 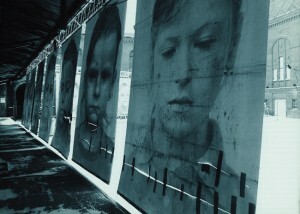 1988, 50 years after the infamous "Kristallnacht" Helnwein erected a 100 meter long wall of pictures in the city center of Cologne, between the Ludwig Museum and the Cathedral to commemorate this night. He confronted the passers-by with larger-than-life children's faces in a seemingly endless row - children lined up as though "to be sorted". The central theme in Gottfried Helnwein's work is the human being. As a victim but also as a perpetrator. No other German-speaking artist of the post-war generation has so hauntingly dealt with the National Socialistic legacy and such issues as fascism, violence and intolerance. He has developed his own provocative, disturbing and to some extent shocking visual language in which its passion above all is dedicated to the weakest of the victims: the children. His images are a constant silent appeal against collective denial and repression. Helnwein's installation "Ninth November Night- Selektion" has been shown in many German cities, amongst them Berlin and Cologne but also in Russia, Switzeland, Japan and Ireland. The screening of his documentary, "Ninth November Night" at the Museum of Tolerance comes at a time so in need of its message of remembrance and tolerance. He currently lives in Los Angeles and in the Republic of Ireland. His art installations in Public spaces throughout the world include monumental images - some of them several stories high, which have been exhibited in Los Angeles, Berlin, Vienna and recently in the city of Kilkenny in Ireland, where he showed huge pictures of Irish children, which covered many of the tallest buildings in the city. Helnwein has a studio in the Arts district in downtown, Los Angeles. THE CURATOR: Gisela Guttman, artist and artist representative, spent her childhood in war torn Nazi Germany. A Catholic, she lived a childhood of deprivation and danger as a displaced person. She was on of the few members of her kindergarten class to survive the 1942 bombings that leveled her native city of Cologne. Following the war, she learned the full truth and lessons of the Holocaust, and felt compelled (like Helnwein) to find ways to perpetuate the memory and awareness of what intolerance can wreak. Die Kunst von Gottfried Helnwein im Unterricht - online. Hochschulen, Universitäten, Schulen und andere Bildungsinstitutionen zum Werk von Gottfried Helnwein.